This is an ideal post driver for most farmers, ranchers, and fencing contractors who have a skid-steer loader. 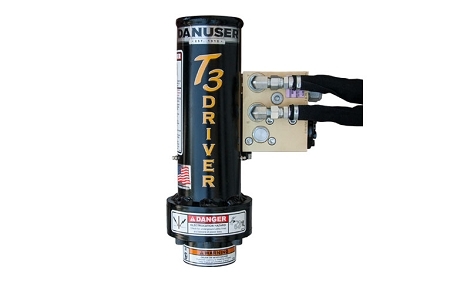 T3 Post Driver is a small driver that delivers big time results! The T3 Driver will drive T-posts up to a 3" O.D. (outside diameter) pipe at a rate of up to six strikes per second. The top of the post is fully contained to prevent kick out and protected from damage by the strike plate. Use your skid-steer to carry the weight of the driver. There is an offset skid-steer quick attach which allows the operator to drive parallel to the fence line, a bolt-on/weld-on bracket that mounts to almost any flat surface, and a tilt bracket for up to 20° adjustments left or right. Use down pressure from the skid-steer loader to drive more posts in the ground faster. The T3 Driver includes one bolt-on/weld-on bracket, hoses and flat face ISO couplers for simple plug and play operation.